»» DEMOLITIONS PICTURES | RETAINING WALLS | CONCRETE BREAKING PICTURES. Major demolition and construction projects, we do any size project, including demolitions, design, excavations, retaining walls demolitions and construction, retaining walls made of CMU, concrete retaining dirt walls, planter retaining walls construction, removals, renovations, deconstruction and demolitions. We have the right demolition equipment and experience. In business since 2003, located in Ventura County. Concrete can be shredded to dust! vacuum to avoid dust and mess! Ventura County General Contractor and demolition business Services | Oxnard, CA. 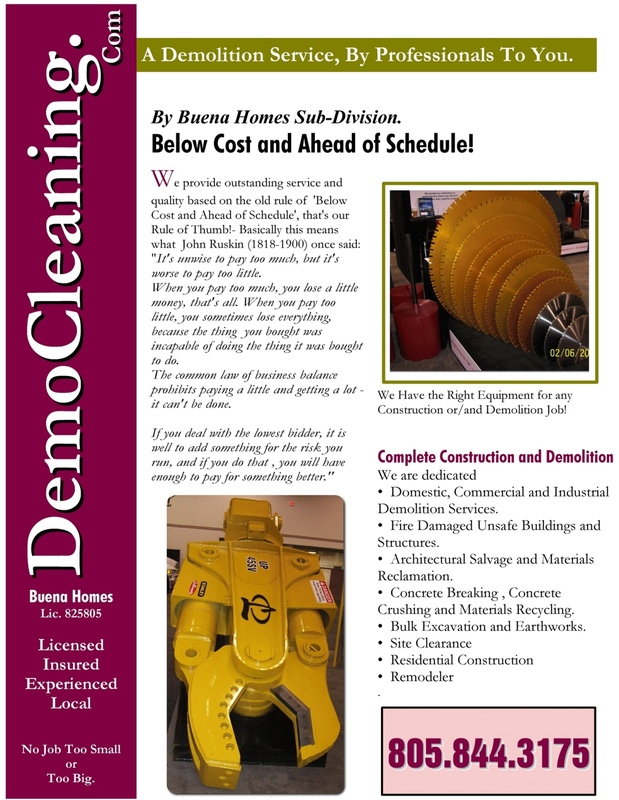 To rid of undesirable concrete; call me. Small demolition projects we do too! demolishing, trash hauling, dumpsters services, job site cleanup and grading. Septic contractors - El Rio,CA. Concrete Cutting |Wet Saw Cutting Services | Oxnard, CA. Los Angeles County General Contractor and demolition Services, B2B. The type of demolition that we do here, it’s that of light demolitions, in commercial, residential and middle to small size demolitions. We do demolitions to build back a new modern structure, to renovate concrete, patios, decks, houses and Except as provided in this section, a general building contractor is a contractor whose principal contracting business is in connection with any structure built, being built, or to be built, for the support, shelter, and enclosure of persons, animals, chattels, or movable property of any kind, requiring in its construction the use of at least two unrelated building trades or crafts, or to do or superintend the whole or any part thereof. We sometimes get a work load that for it own nature does not allow us to do all the work by ourselves, and typically when we are very busy, I hire sub-contractors that are specialists in their trade. We do demolitions before digging for new foundations, new patios, new decks, new additions, new homes, and new retaining walls and before forming for concrete work. Right tools for the required application! We do demolitions of framing, concrete, dirt excavations, footings, roofing, fences, patios, pools, concrete and anything that requires to be remove, disposed and or recycled. I have dump trailers, utility trailers and dumpsters dedicated for trash ,dirt removal, concrete removal and construction debris. We can recycle concrete, wood, plastics and metals of any type. We own the equipment and the tools for doing all the work that we offer. You can rest assured with us that; we will use modern and specialized equipment and tools to do the work we do. For an appointment or price quote call me to (805) 844-3175.